Spanish bathroom furniture major Royo Group is setting foot in India. It has entered into a joint venture with Vinay Kothari Group to form Royo India. As its first business operation, it has sewn up a strategic association with Kerovit by Kajaria to supply vanity units. 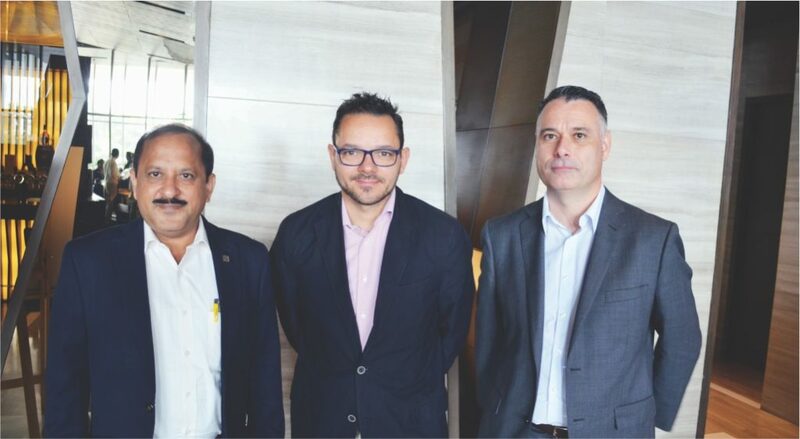 Sourcing Hardware caught up with the Royo Kothari Vanity India managing director Rajeev Okhandiar (RO), Royo Group CEO Raul Royo Lopez (RRL), and business development director Arquimedes Parra (AP), at Delhi’s Aerocity for an exclusive conversation. What is the nature of the association between Royo and Kerovit? What are the synergies of the association, and how will it mutually benefit the players? RO: We are the leading manufacturer of bath furniture and accessories in Spain and a clear market leader in Europe since the last 45 years. We have been manufacturing bathroom vanities, mirrors and lighting, and marketing them globally under our Royo brand, and also as a private label supplier for different sanitaryware companies. Royo-Kerovit is a perfect match in India of two quality manufacturers who complement each other in the sanitaryware segment. The aim of this tie up is to bring customers up the value chain. This particular objective, and the fact that the market is not being addressed and serviced by any organised player, was the genesis of the Royo-Kerovit tie up. Royo’s association with Kerovit by Kajaria in India is a part of Royo Group’s multi-location expansion strategy. Royo is in a unique position to generate enough output from its manufacturing units in Spain, Poland and Mexico, to service the wide network of Kerovit customers in India. Through this tie up, the customers are assured of absolute European quality, prompt supplies and Indian prices. Besides as a new entrant in India, partnering with a known and established brand as Kajaria will help us push our brand identity. The two brands are equally strong in marketing and invest substantially in their brand positioning, thereby complementing each other.Both the brands, Royo and Kerovit, are looking forward to a profitable and a sustainable business. What quantum of business do you expect to gain from this tie up with Kajaria? What is the ballpark estimate of the market size in India? RO: It will be too early to give a definitive number as this association has just started. The current output at our Valencia plant is 100,000 units per month and this can be doubled as the market grows in India. With a vision of very high potential and growth expectation, Royo Group is fully prepared to set up a similar plant here in India which can match any demand and adapt with design and material as required in an Asian market. This is based on our experience of operating in South American markets and China. The vanity segment is dominated by artisans. The current market size in India can be estimated based on the quantum of premium segment wash basins being sold by all the brands together. The rough estimate is around 4.8 million to 5 million units per annum. Are more such associations in the offing? Is there a plan to manufacture in India? RO: Well, our strategy is to work exclusively with leading brands like Kajaria, and we see that this is going to be a very long term exclusive arrangement with Kerovit by Kajaria. We view this relationship very seriously and with a long-term perspective. Keeping this in mind we are planning to set up our Indian manufacturing facility very shortly. You have stated that Royo Group introduces new business platforms in different countries. What are these platforms, particularly with reference to India? RRL: By new business platform we mean different channels and segments, e.g. DIY segment, online channel, trade segment (professional division), project market, global companies division, etc. In India our entry strategy is that of a global company division, wherein we will be working with leading manufacturers of sanitaryware products and will offer them exclusive ranges as per their requirement. Our plans are to come up with more such innovative routes, so as to reach customers with the best of convenience and value. What is the vision of Royo Group for India and what strategies will you adopt to be a significant contributor to the group? AP: As with other global companies, Royo Group views India as a huge market that is growing year on year unlike western countries which are heading towards saturation. Today 80% of Royo Group’s business comes through exports outside Europe. Royo India’s vision and strategy, with Royo Group Spain, is to bring innovation to the Indian market, create demand, and service customers through the state-of-the-art plant that we will set up here in a few years from now. We are convinced that, given the potential of our product segment in India, the Indian operations are going to be the biggest contributor to Royo Group Spain. What are the short-term and mid-term goals that you have set for yourself? RRL: Our short term goal is to penetrate this new segment of bath furniture in India by servicing it through our plants in Spain and Poland. The mid-term goal would be to establish an assembly and manufacturing plant so as to service the growing demand, which we are expecting and striving to create. In the long-term we have plans to add more ranges and other related products which complement our existing solutions. In sum we have set before ourselves the goal that, in the next 10 years we will be a major player in the segment in India, and intend to contribute 5% to the group’s turnover in the next five years. In the last 40+ years, Royo has made itself available in 60 countries across Europe, America and Asia. What global best practices are you bringing to India? AP: We believe in quality and innovation; these have been our key reasons for success and sustainability, even during the global recession. Going forward, our operations in India will adopt similar practises and work towards providing maximum value to customers’ money and profit to us. Royo Group has world class automised manufacturing facilities,and using this we are able to offer to our customers quality assurance and value for money. Going forward we will bring to the Indian market technology that is affordable, and internal best practices related to human resource, employee well-being, finance, environment, etc. Royo India will not manufacture for the Indian market only, we are targeting South East Asia, SAARC and Middle-East markets too. One can estimate the magnitude that we are talking about. How soon can we see the complete Royo product line in India? What is the distribution model that you are working on, and what do you think will attract channel partners? RO: We are sure that by beginning of the next financial year Indian customers will have a complete range of products – vanity unit, mirror, lighting solutions with 10-15 years of warranty – available to them from our European plants. As for the distribution model, our strategy has been to distribute our products by working exclusively,for our exclusive range, with leading sanitaryware brands. We have followed this practice and will be working with Kerovit by Kajaria. We will service their distributor channel in terms of post sales support and marketing. What is Royo’s investment in R&D and how is it helping the group keep itself ahead of competitors?